Don’t call it “Gran Turismo 7.” Once you realize Gran Turismo Sport, the latest installment of the iconic diving simulator franchise is its own unique beast, the more you’ll be open to its wonders. Today on ShopTalk we’ve played through Gran Turismo Sport for a few weeks now and we’re finally about to give you the word on the game and if it lives up to the name. Let’s get this out of the way first: Gran Turismo Sport is a drastic departure from the recent past installments. That is a good thing. It marks something of a departure from PS3-era GT games – which, as it turns out, is no bad thing. The main focus of the game is its online integration. It is FIA certified, the only e-sport recognized by an actual motorsport commission. Upon booting up the game it is clear that you are in for one giant virtual international racing tournament with maybe millions of other players. Unfortunately that means there is no single player mode for you to play through offline and solo. However it also means that Sport is the most streamlined and focused installment ever. According to the series developer Kazunori Yamauchi, the mandate for GT Sport is that *anyone* can drive. It will transform as many gamers into true gearheads by way of accessibility and depth. In many ways this is also sort of a return to form for Gran Turismo. Many of the common complaints surrounding the last few installments were that they were bloated affairs with too many features and modes that lacked focus and value. Instead GT Sport does away with anything but the essence of Gran Turismo: driving and cars. Switching your game to “Professional” not only pits you against more challenging opponents (AI and real people) it makes the driving physics more realistic than ever before. For instance, you now have an all new heads-up display. This allows players to get into the minutiae of being in one of these cars. You can adjust the brake balance and traction control all while driving. One criticism we’ve seen is about how there is little in the way for playing offline by yourself. You have an arcade mode where you just pick up and drive a car anywhere. And you also have a three-stage “campaign.” This is where you go through “driving school” and learn the fundamentals of the game; “Mission Challenge” where you are tested on those and “Circuit Experience” where you compete in races to earn points and unlock cars and tracks. However unlike previous Gran Turismo Games, it is the online multiplayer that is the center, not the campaign. Should you choose to test out these cars in a virtual space without a worry for competition, you can. And the stunning graphics make this the most lifelike installment yet. And the actual game play will match that beauty too. Previous Gran Turismo games pushed the top ranking player to close the gap on an assigned fixed time period. It was rare for races to offer an artificial intelligence factor. Now Sport has introduced as new “professional” difficulty to give top players a whole new challenge to face. Thanks to the he FIA (Fédération Internationale de l’Automobile), the governing body of motor sports, we have an officially sanctioned Nations Cup and Manufacturer Fan Cup. These tournaments begin soon. For now players are competing in daily races to increase their ranking and stats before entering either tournament. The daily races take place every 20 minutes at a constantly rotating set of 3 tracks. In addition to speed, the Gran Turismo series has always favored realism and “clean driving.” Meaning they award players for driving well and not using underhanded tactics such as bumps and crashes. Sport now assigns you a “’sportsmanship rating’ that decreases everytime you get involved in a track clash or collision. In the few weeks since launch, Gran Turismo Sport only has 162 cars at launch. To put things into perspective, by the time Gran Turismo 6 was near the end of its support life cycle, it had over 1000+ cars. However it is quality over quantity. Right out the gate you have access to cars like that range from the Peugeot RCZ to the mighty Bugatti Veyron. Some of these have a new life in the virtual world. There are fantasy ‘Group 3’ and ‘Group 4’ variants. Those allow players to continue customizing their cars before taking to the massive online tournament. Gran Tursimo Sport gives you access to over 40 different track layouts across 17 locationsaccross the world. Most of these are fictional venues as opposed to real and licensed ones. However many of these strike a resemblance to several famout tracks such as Le Mans, Silverstone, Monza, Spa and Fuji. GT sponsors like Hatch, Suzuka, Willow Springs, the Nurburgring and Bathurst have all made it into the game. You do get tracks from Interlagos too. If you don’t wish to spend your time only competing you can soak up GT’s innovations in one of several single player modes. All together it may be too early to call Gran Tursimo Sport the best Gran Turismo Game ever. Howeve, it is the best driving simulator around. And that does not look to be changing any time soon. 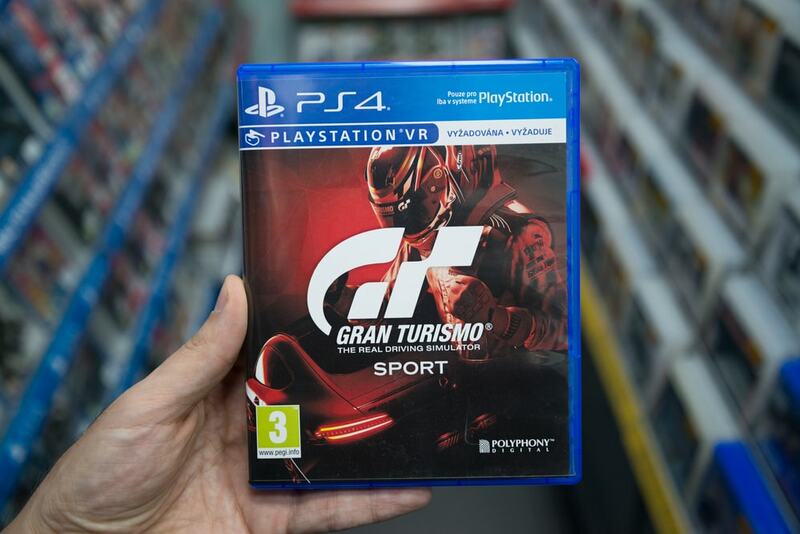 Stay tuned for coverage of GT Sport’s online e-sport tournaments and news on updates and tips on the game right here on ShopTalk.